I’ve had a long health and fitness journey and I’ve pretty much hit every obstacle along the way. My journey still continues as I get closer to my goals and these goals have actually changed along the way. As I’ve accomplished one goal, I’ve set another to strive for. I think I’ve been successful because I’ve always set small goals along the way or implemented small changes in my diet or lifestyle. I’ve found that making small changes are easier to stick to. Once you make these changes and stick to them, this is where habits are made. This is a biggie! Those new healthy habits make a huge impact on your overall health and wellbeing. Not eating past 8 pm for example might be a health change you want to implement but soon that becomes a habit and you no longer feel the need to eat late at night. For me it was making sure I was drinking enough water. That was a huge health change for me. Once I got into that habit I gained energy, cleared my mind and I actually lost some weight as well. Making too many changes all at once or implementing too many restrictions at once will overwhelm you and frustration will cause you to abandon these goals. Smaller more attainable goals will almost always lead you to success. Ok, so where do you begin if your starting your health journey? I swear to you that this is the recipe for success! Even if you have very little time in your day, these are manageable goals to set and achieve. So lets break this down a bit so you can see how easy this is. Eating Clean means that everything that you put in your mouth is going to benefit your body in some way. Will it nurture your body? Will it give you energy? Will it keep you feeling full long so you’re not tempted to hit that local fast food joint? Eat whole foods, fresh foods, foods that DO NOT come from a bloody box! Eat loads and loads of veggies and good quality proteins. Consume good fats like avocado, natural peanut butter and use coconut oil for cooking. I also prefer to consume brown, wild rice and quinoa vs white rice. I just want to provide my body with all the extra nutrients that I can. I don’t like empty calories. Every calorie will be provided to me from quality sources. Staying hydrated is so vital for our over all health and wellbeing. Drink loads of water! I drink 3 L a day and if I drink less I feel like my mind is in a haze and the energy has been sucked out of me. The more active you are, the more water you need. Replenish what you’ve lost. I fill up a huge water bottle that holds almost 2L of water. I refill it when needed and its a reminder for me because its kept in view. I also keep another bottle that’s always filled on the kitchen table to remind my kids to keep drinking water throughout the day. Sometimes if it’s not in your face, your not going to remember to drink it. Another great way to make sure you remember to stay hydrated is set alarms on your cell phone. That’s a great tool, use it! I would say don’t drink less than 1 1/2 – 2 L per day for optimal health. Here’s a big one that freaks people out. Exercise daily! That doesn’t mean full-blown workouts daily but any physical activity you can accomplish. It would be optimal to get to the point that you can complete a workout a day, even if it’s a short one. Baby steps though. Work up to that point. Even long walks are an awesome way to stay active and connect you to nature. That’s a WIN-WIN in my books! I’ve been known to take two-hour walks with the baby and I feel fantastic after! If I can implement these small health choices into my life, then you can totally do it too! I’m a mother of 5 and my days are crazy busy. I’m busy with bringing the kids to their Girl Guide & Brownie meetings, swim class, and everything else that comes up in our hectic life. Somehow, in someway you have to try to make the time. Even if it’s an intense 10 minute workout, get it done. Your body will thank you! Eat Healthy, Be Healthy!!! 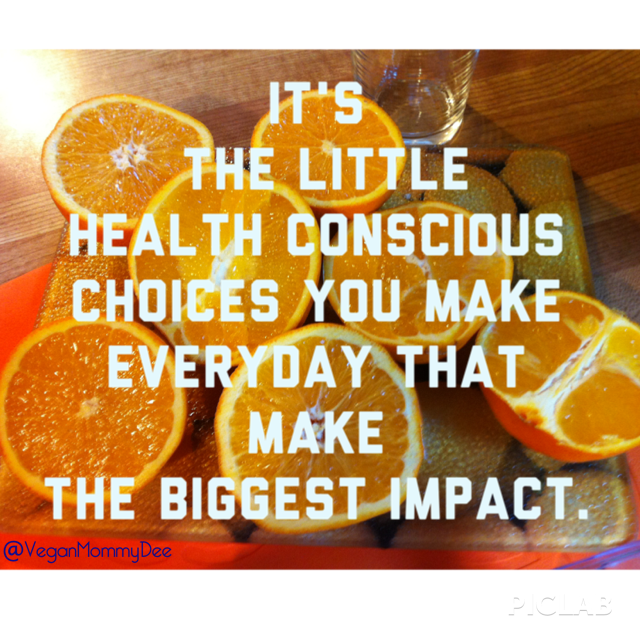 Everyday we make choices about our food, so make health conscious ones! Don’t make choices that are going to leave you guilt ridden. Even the most popular comfort foods can be made in healthier ways. I’ve made delicious healthy mac & “cheese” and pot pies which people love! They couldn’t believe they were vegan and healthy because they tasted so good. This is why I keep trying to tell people that healthy CAN taste good! Actually it can taste pretty darn amazing! I’ve noticed that people can do pretty well making good food choices for meals for the most part but find it very difficult to snack healthy. One of the biggest lessons I leaned on my weight loss journey was to swap unhealthy snacks with healthy ones. If you’re a chip lover try eating homemade sweet potato chips or making yummy kale chips as an alternative. They are so tasty and guilt free! Even my teen has grown to love them and makes them at my house! If your more of a sweet tooth then swap things like sugar loaded ice cream with a healthy homemade version. Process frozen bananas and peaches or mango, freeze in a container for 10-15 minutes to set. How simple is that? Anyone can make it! When your on the run and busy carry nuts and seeds with you or fresh fruit. Everyone who knows me is totally used to me pulling out healthy snacks from my purse when I’m hungry. If you’re not prepared then you will be tempted to pick unhealthy food choices, so be prepared! I wasn’t always a healthy individual and for most of my life I made poor food choices. I went from being the over weight child to a teen with an eating disorder and I was down to a size 1/2. After having all my children I then ended up very over weight and feeling horrible. I had a very significant amount of weight to lose in order to feel healthy! In 2009 I started to make little small improvements to my diet and becoming a little active. In 2010 I became more active and started walking a lot. Yes walking! So simple right? It was so effective though and the weight started coming off finally and people around me were noticing! By 2013 I lost about 80 lbs and I never dreamed I could accomplish that but I did. Am I done with my health journey? Nope. I have a little more weight to shed but I’m now focused on toning and becoming stronger everyday. So to anyone out there struggling to shed some weight … you can do it! If I can so can you! Keep going! Keep trying! Rome wasn’t built in a day and your weight isn’t gonna come off over night either. Be patient with the process, make healthy food choices and be consistent with your workouts and it will happen! 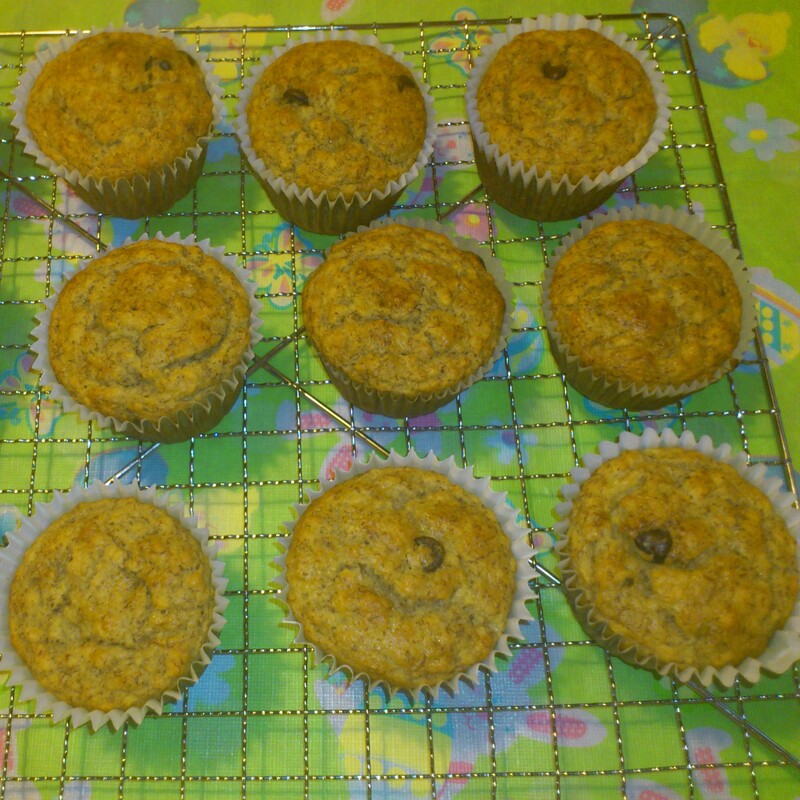 Yummy Banana Vegan Chip Muffins! Place 3 TBSP of flaxmeal in a small bowl add add the 6 TBSP water to it. Mix well and set aside for a few minutes. With a fork mash 3 ripe bananas in a medium-sized bowl. add 1 tsp vanilla, 1/4 cup oil and 1/4 cup sugar to banana mixture. You can add more sugar if you like sweeter muffins but I think 1/4 cup is enough for us. In another medium-sized bowl add the 3/4 cup brown rice flour and oats. Add the baking powder to the flour mixture and combine well. Add the flaxmeal mixture into the wet ingredients and mix well. Next add the wet ingredients into the dry ingredients. Now add the 3/4 cup unsweetened almond milk. Combine. Toss in the vegan chips and give it another mix. Line 1 12 muffin baking tin with paper liners and fill them half way for medium-sized muffins. Grab another muffin tin and place 4 more paper liners in it. Fill those suckers up too! You could also just do 12 larger muffins and bake them for 25-27 minutes. We prefer medium-sized muffins however. Pop them into a 400 F oven for 23-25 minutes. Once they are baked I let them cool off inside the tins for about 5 minutes. Then I transfer them to a wire baking rack and let them cool completely before placing them into a air tight container. 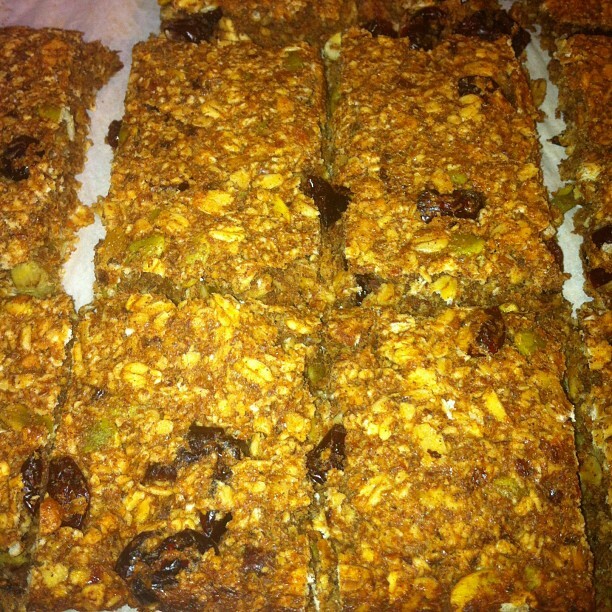 Here is my favourite recipe for healthy oat bars! I love this recipe that I came up with because it’s made with healthy dates and prunes. Dates have iron, calcium and fiber in them as well as countless other healthy benefits. Prunes also have fiber in them as well as vitamin C, A, K and they are said to be a good anti colorectal cancer food choice. I really like how the dates and prunes act as a sweetening agent in the recipe! I’ve added the option of adding pure maple syrup to them as well if desired. I’ve made them with and without the maple syrup and both ways taste really good to me. The maple syrup adds a bit of extra sweetness and of course a tasty kick to the bars though. I love oat bars because they are easy to make and can be a great snack to eat on the go! Another bonus is that this recipe is flour free too! You will need a baking pan. Depth will depend on how thick you want your bars to be. Parchment paper to line your baking dish or coconut oil to oil your dish with. Add 1/3 cup warm water into the food processor and process until smooth. Add more water if needed until it’s well combined. Also add the vanilla extract and combine all ingredients well. In a large bowl add the oats, cinnamon, pumpkin seeds and flaxmeal. 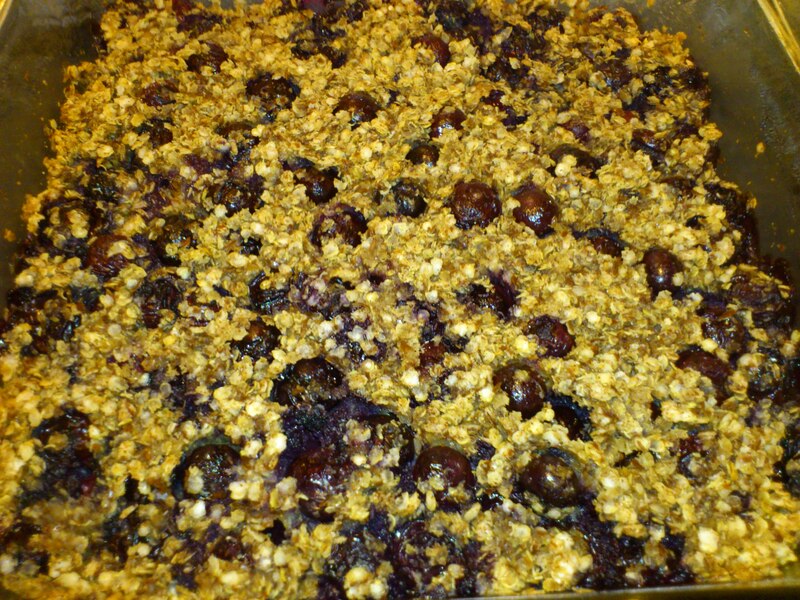 Add the cranberries or other dry fruit of choice & finely chopped almonds to dry mixture. Combine well. Add the date & prune mixture into the dry ingredients. Make sure to mix everything up well. If you’re adding in the maple syrup then toss it in now and combine well. Add the mixture to the baking pan and even it out well. I’ve been on a bit of an organic blueberry kick lately! It seems that somehow I’m always throwing blueberries into my baking these days! These antioxidant rich berries have so many health benefits so I feel good about incorporating them into my baked goods. They also help to boost your immune system which is especially important to me during these wretched winter months. [insert rant] … Yes I HATE WINTER with a bloody passion! Stupid cold never-ending months of torture! As I was saying blueberries have many health benefits such as aiding in heart health, brain function, helps reduce belly fat, helps with constipation and digestion and they are known for being natures anti-depressant! This recipe is super easy as are all my recipes. I’m a mom of three and I don’t have the time to make fussy recipes! I’m also a strong believer in the fact that less is more when preparing food! This blueberry quinoa cake is also great for breakfast despite the fact that I’m calling it “cake”. Another added bonus is that it is flour free, so our waistlines are thanking us! Next add the melted coconut oil and the maple syrup or agave. Combine well. Add the milk and give it one last mix to combine all the ingredients well. *Pop it into the oven at 350 F for 35-40 minutes. Let it cool for a while so it can set properly and you can slice it up. NOTE: If you want your cake to take on more of a bright purple colour instead of having all the blueberries in tact like mine in the pictures you can give it a mix at the 20 minutes mark. The blueberries will be super soft and will release their beautiful bright colour into your cake. I’ve made it both ways and either way it’s yummy! Healthy protein & omega rich cake. Flour free! 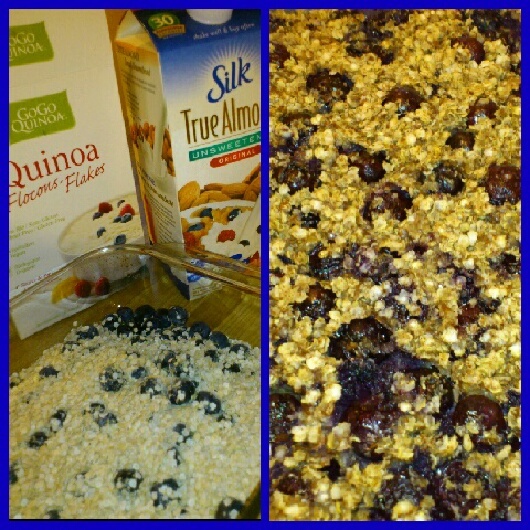 Healthy & simple blueberry & quinoa cake! 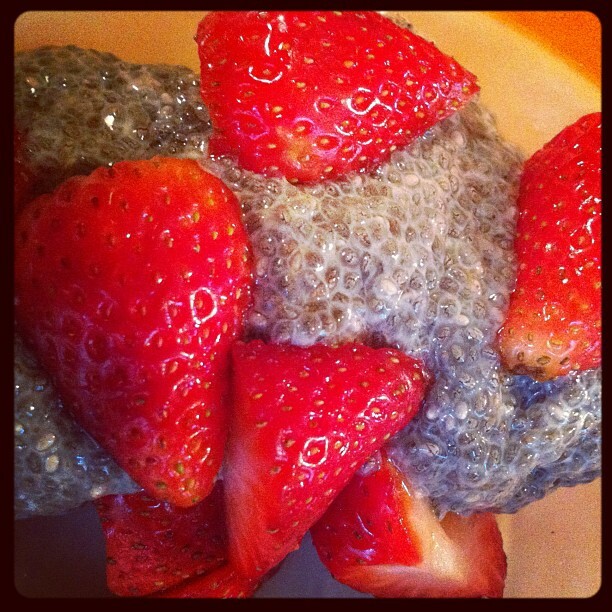 I’ve falllen in love with this easy to make and healthy pudding! I like to top it with fresh strawberries or blueberries. It looks so pretty and tastes yummy! Combine the above ingredients in a large bowl or glass Tupperware. Mix it up for a couple minutes until it starts to thicken up. Give it a good stir every 10 minutes for about an hour. Pop it into the fridge overnight so it thickens up to the pudding consistency we’re looking for. When your ready to serve it place the desired amount into serving dishes and top with some healthy fruit!